" If only we could go to the ship and get away from here." Alone in the base Dortmun plays chess awaiting the return of the rest of the resistance from the attack. On the saucer Tyler and another man rescue the unconscious Doctor from the operating table. Ian & Craddock are freed on the ship. 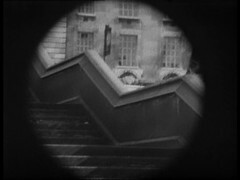 There is much fighting leading to Susan & Barbara being separated (during these scenes we glimpse the Black Dalek leader for the first time). 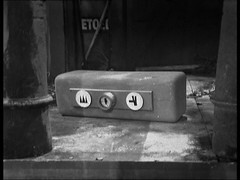 Ian is trapped on the spaceship and can't escape while Barbara is taken back to the underground base by Jenny. The attack was a failure, the bombs were useless and many of the resistance are killed. Tyler is going to leave London, but Dortmun intends to stay. 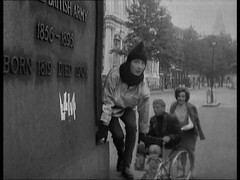 He wants to go to their alternate base at the Civic Transport Museum: Barbara & Jenny agree to take him there. The Dalek saucer leaves for the mines with Ian still aboard. 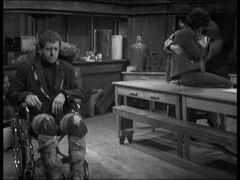 Ian encounters Craddock, converted to a Roboman and overpowers him rescuing his prisoner Larry Madison. They dispose of the body and find somewhere to hide for the remainder of the journey. 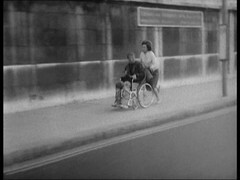 Susan & David are fleeing from the searching Daleks when they come across another resistance fighter Baker, who is carrying the still unconscious Doctor who he passes to them. 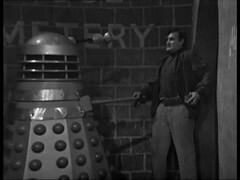 As he leaves he is caught by the Daleks and exterminated. 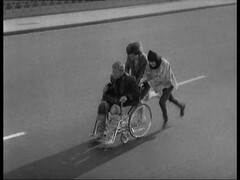 Barbara, Jenny & Dortmun flee across London to the resistance's museum base. Dortmun believes he has perfected his bomb and gives Barbara his notes to show the Doctor. 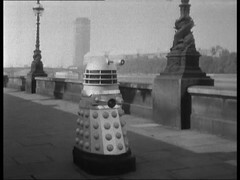 Dortmun sneaks outside with his new bombs as Jenny sees approaching Daleks. Dortmun attracts their attention getting himself exterminated but blowing them up in the process proving that they work. 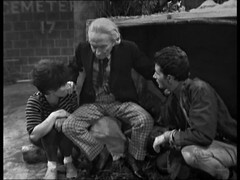 The Doctor starts to recover with Susan's help. 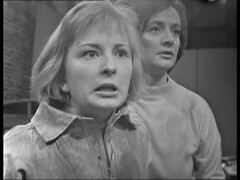 She wants to go north with David but the Doctor wants to stay near the Tardis. David gets the Doctor on side by flattering him and asking for his opinion. 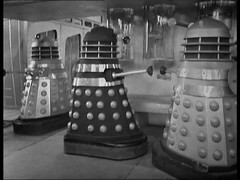 The Dalek saucer lands discharging it's crew of Daleks & Robomen plus their prisoners allowing Ian & Madison to escape. 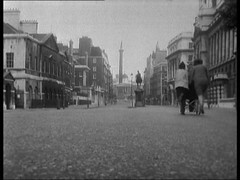 Back in London two Robomen approach the location where the Doctor, Susan and David are hiding carrying a box which they leave behind. It's a massive bomb and the clock is ticking. MAN: Why? You killed my mother and my brothers! MAN: Get away from me! No! 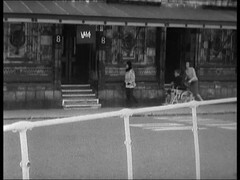 Then, shortly afterwards, just after Baker has returned the unconscious Doctor to David & Susan he too is cornered and gunned down. DAVID: Well, I couldn't go anyway. SUSAN: David, David, perhaps you could. I could ask Grandfather. I'm sure he'd let you come. 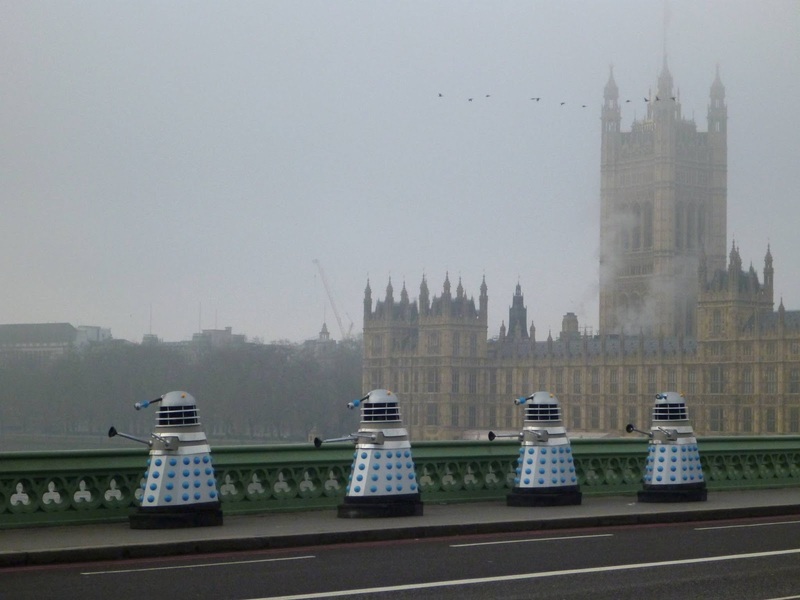 We could go to a place that had never even heard of Daleks. DAVID: And what happens if there's something unpleasant in the new place? SUSAN: We'll move on somewhere. DAVID: No, Susan, that's not for me. DAVID: Look, things aren't made better by running away. SUSAN: Well, it's suicide to stay here. DAVID: This is my planet! I just can't run off and see what it's like on Venus! SUSAN: I never felt there was any time or place that I belonged to. I've never had any real identity. DAVID: One day you will. There will come a time when you're forced to stop travelling, and you'll arrive somewhere. Which in turn ties in neatly with the sentiments she expressed in the Sensorites episode 6 about wanting to go home and belong somewhere. I love the scenes between the Doctor and Susan where they quarrel and then, with a small amount of flattery, David talks the Doctor round. The ending isn't bad either with the camera closing in on the bomb jumping in a bit further with every tick. 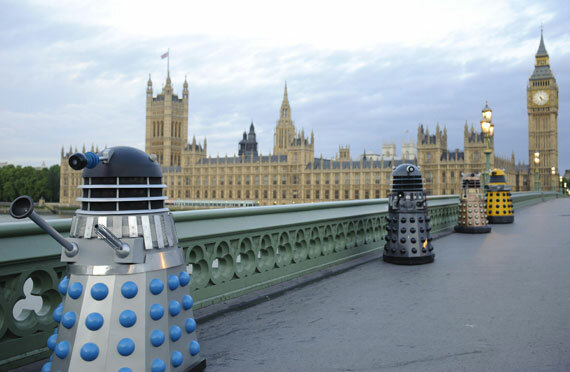 Even though the Daleks on Westminster Bridge is just publicity it's been aped many times with Modern & reproduction Daleks, for the documentary 30 years in the Tardis (Future Doctor Who writer Mark Gatsis is in one of those Daleks!) and for An Adventure in Space & Time!. 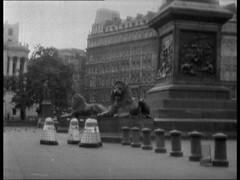 We continue through Whitehall and past the Cenotaph which has been marked by the Daleks in what we assume is their own script. Next we visit Trafalgar Square. 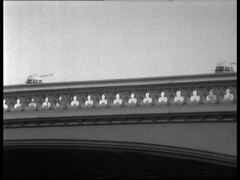 This sequence is famous for having had a moving van visible in the back of some shots which was removed for the DVD release. If you look carefully you can see something moving in the background still. Next we're at the Albert Memorial in Kensington. Before our final location on this trip the neighbouring Royal Albert Hall. Given the final location, and that we see vehicles inside the museum I guess they're mistaking the Transport Museum for the Science Museum in Kensington! 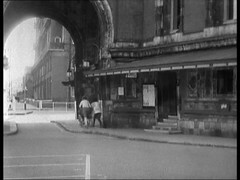 The start of the sequence firmly places the Tube station base they leave from on the South Bank of the Thames, probably west of Westminster bridge making Vauxhall station (at the time of filming uncompleted) a likely candidate for it's fictional location which in turn nicely ties in with roughly where we thought the Tardis landed in episode 1. 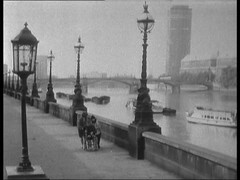 A list plus photos of all Dalek Invasion of Earth locations can be found here. 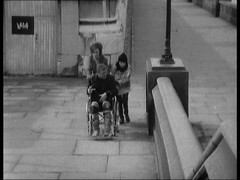 The character of Dortmun is an interesting one, he's an early example of a crippled genius in a wheelchair. I can find two antecedents: The X-Men's Professor, who first appeared in late 1963, and Doctor Strangelove, the titular character from the January 1964 film. Of the two I'd say the later is possible the influence that Terry Nation is most likely to be aware of. 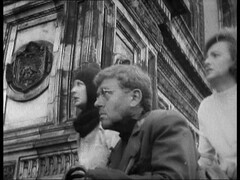 Nation famously returns to the idea many years later in Genesis of the Daleks with Davros, the creator of the Daleks while Doctor Who does it again with Professor Judson in Curse of Fenric and John Lumic in Rise of The Cybermen/Age of Steel. 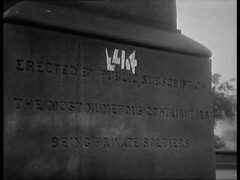 Nation's Blake's 7 features Forbus in Traitor, written by Robert Holmes the script editor on Genesis of the Daleks. Other examples include Professor Armstrong, creator of the Cybernauts in TV's The Avengers, Niles Caulder from DC Comics Doom Patrol, Dr. Everett von Scott of the Rocky Horror Show and Chip Chase from the Transformers animated series. At some point it has become a little bit of a trope which makes viewers and readers think "Oh no not again" and recall earlier examples. Dortmun's name conveys something of the World War II undertones to the story bringing to mind the German town of a similar name. Playing Dortmun is the actor Alan Judd who was active in Television from the late 1940s to the early 1980s. 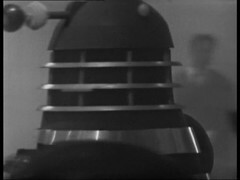 After a false start in the previous episode with the oddly coloured Dalek, who we briefly glimpse in the episode recap, get the début of the Black Dalek in this episode. He gets no big intro here, being glimpsed in battle scene, before he's fully seen on the ship. 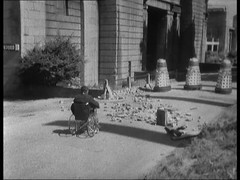 The odd Dalek from the last episode faired only slightly better, just rolling into slot before it orders Thompson to be killed. 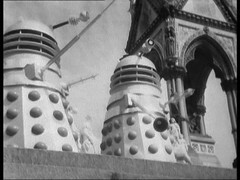 Physically they are the same Dalek case: They're the only Daleks in this story with the traditional black eyes where as all the silver Daleks have silver eyes and both have the broken neck ring. 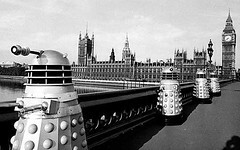 As to are they the same Dalek.... I'd say yes. Both seem to be commanders of a sort. The odd one disappears, the black one appears fulfilling the same function. At a guess I'd say the prop wasn't 100% finished for the previous episode. 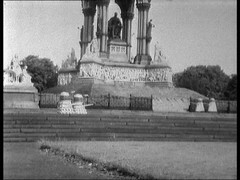 *IF* this story ever comes up for a revisitation DVD edition I'd be tempted to repaint the odd Dalek in episode two with all black skirt panels like the Black Dalek in the remaining episodes as part of an alternate angle edition with the CG effects and the removed van. 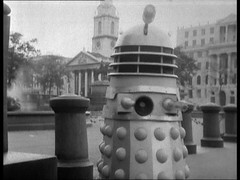 Frequently referred to as a "Dalek Supreme" he, or more likely a similar Dalek given how this story end, returns to menace the Doctor in The Chase, The Dalek Masterplan (and it's Doctorless prequel Mission to the Unknown), Resurrection of the Daleks and Remembrance of the Daleks as well as both Dalek feature films. Differently designed Emperors lead them in Evil of the Daleks & Remembrance of the Daleks (There's two opposing Dalek factions in this story) while Gold Daleks lead in Day of the Daleks & Frontier in Space. 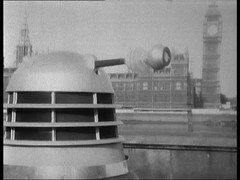 A black Supreme Dalek is shown in Planet of the Daleks, but he's got a gold dome and a slightly different design due to being a recycled movie prop.